The tropical fruit that reminds you to not judge a book by its cover. Dark green and prickly on the outside, but once opened you are treated to the flavour profiles of a strawberry crossed with a pineapple, accented with sour citrus notes. The perfect candidate for a refreshing sorbet. Purée the soursop in a food processor until smooth. 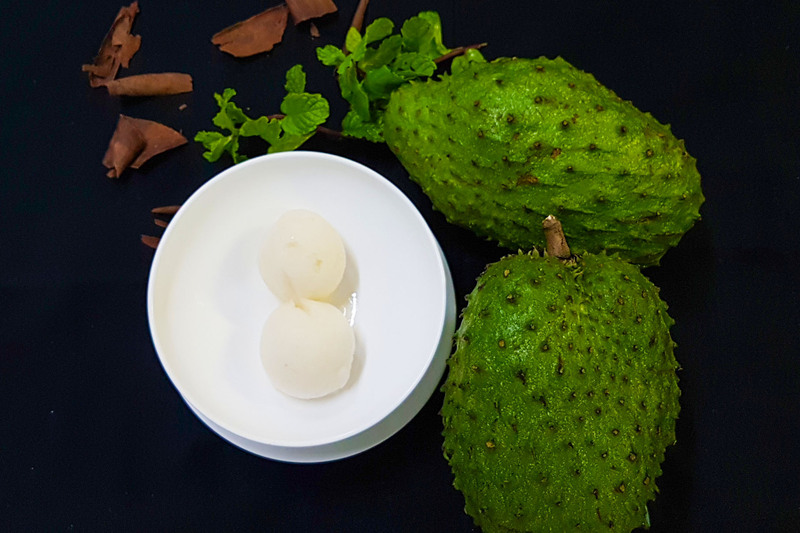 Strain the puréed soursop and place into the refrigerator to chill. This step is not mandatory, but rather recommend for smooth sorbet. While your purée chills, start preparing your syrup. Add your castor sugar to the water in a saucepan and place over a low heat for 5 minutes. Boil the sugar syrup for 1 minute thereafter. Chill the syrup in the refrigerator for 30 minutes to an hour. The syrup needs to be completely chilled. Mix the syrup and soursop purée together and chill again for another 2 hours. After the 2 hours of chilling, put the mixture in to the ice cream churner until its ready to scoop out. Freeze for at least 3 hours before serving and garnish with a fresh mint leaf.